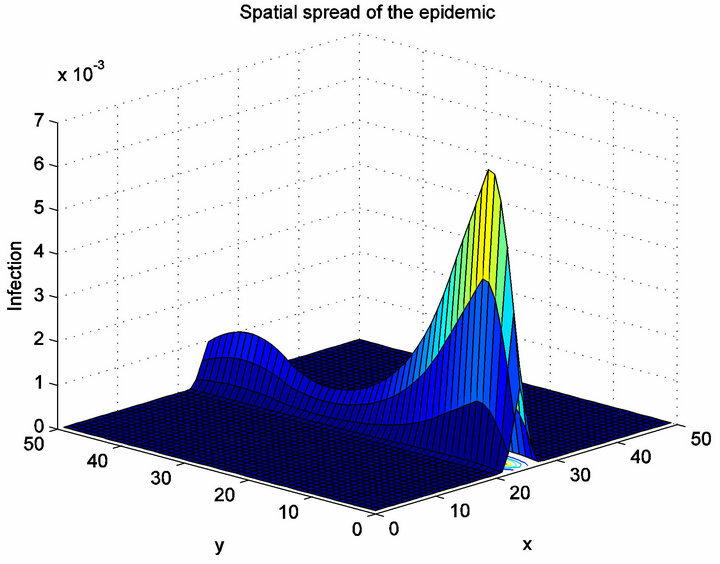 In this paper we introduce a classical SI model to capture the spread of an infectious disease within a population. 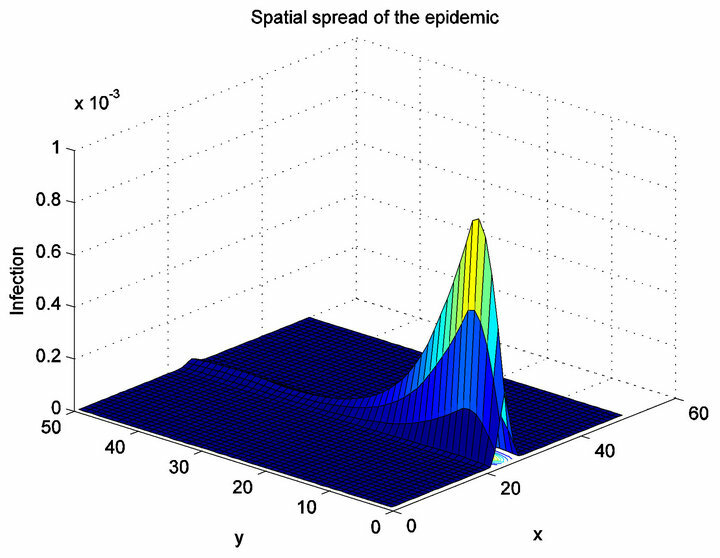 More precisely, the spatial diffusion of HIV/AIDS in a population is modeled. For that, we assume that the spread is due to the anarchical comportment of infected individuals along a road, especially, “lorry drivers”. The question which consists of the control of the infection is also addressed. 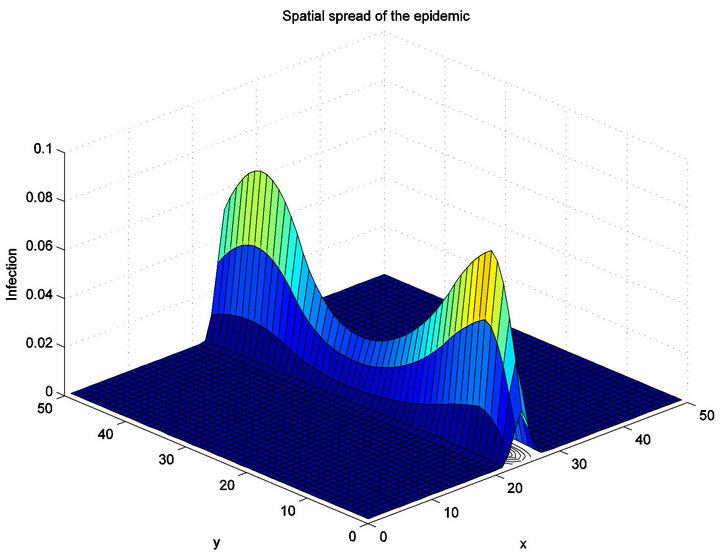 Infected individuals moving from a town to another one, the diffusion is then anisotropic with a main direction of propagation, namely the road direction. Using a semi-group argument and a maximum principle, the uniqueness of a solution to the problem is established. This solution is also estimated. 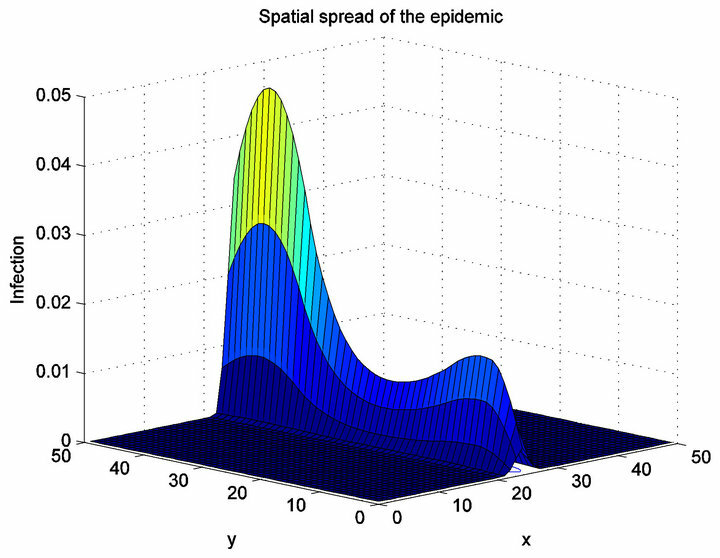 We end this paper by considering some numerical experiments in the case of HIV/AIDS spread in Mali along a road connecting two towns. The no flux boundary conditions mean that the system is isolated. 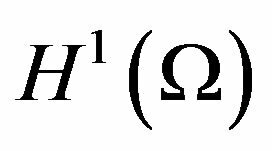 where denotes the outward normal vector to . System (1) has also been used to modelling chemistry reactions (with a different sign in reaction term)  or combustion phenomenon. Even if the dynamics of the system (1) is quite simple, the question we address in this work is: are there parameters that allow to control the system in a finite time in case where the spacial diffusion is directed? In  a model structured by spatial position in a bounded onedimensional environment is proposed and analyzed. 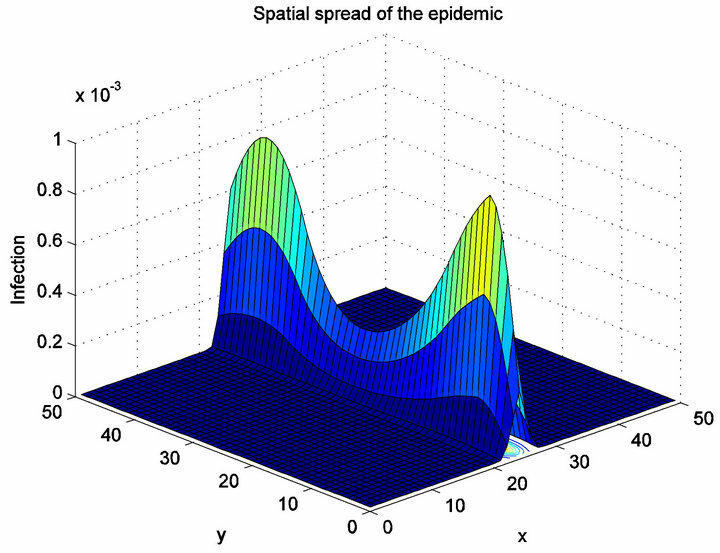 The spatial mobility is assumed to be governed by random diffusion with coefficients and for the susceptible and infected individuals, respectively. In the present paper, the susceptible population doesn’t move away, so that its diffusion coefficient is equal to zero. 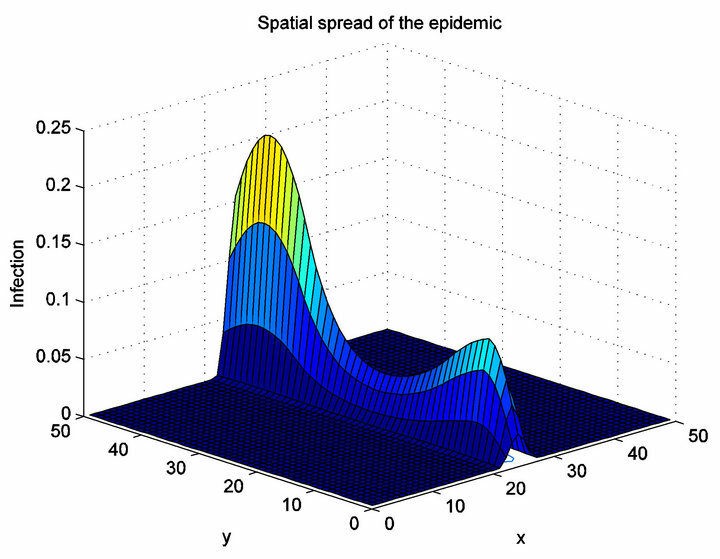 Many other models of epidemics with spatial diffusion are studied, see for example [3,4]. In Section 2 some a priori estimates are derived for the solution of the system (1). In Section 3 the existence and uniqueness of solutions are studied. In Section 4, the existence of coefficients and allowing to control the system (1) in a finite time is derived. This section is ended with some numerical results which take into account the data of the spread of VIH/AIDS in Mali. with homogeneous Neumann boundary conditions and where . which associates to is Lipschitzian with a Lipschitz constant . Proof. 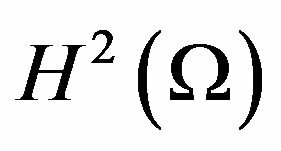 Since the function is continuously differentiable, its derivative is bounded on . We then obtain the estimate by using the fundamental theorem of calculus. Theorem 3.2. Assume that the assumptions on the functions ; ; and hold. Then for all , the problem (1) has a unique solution . The operator generates an analytical semigroup. According to Lemma 2.2 we consider Problem (7) on a bounded subset of . From Lemma 3.1 we know that is Lipschitzian. Therefore, one obtains the existence and uniqueness of a solution by using Theorem 3.1 and 3.3 in . and we get a contradiction. 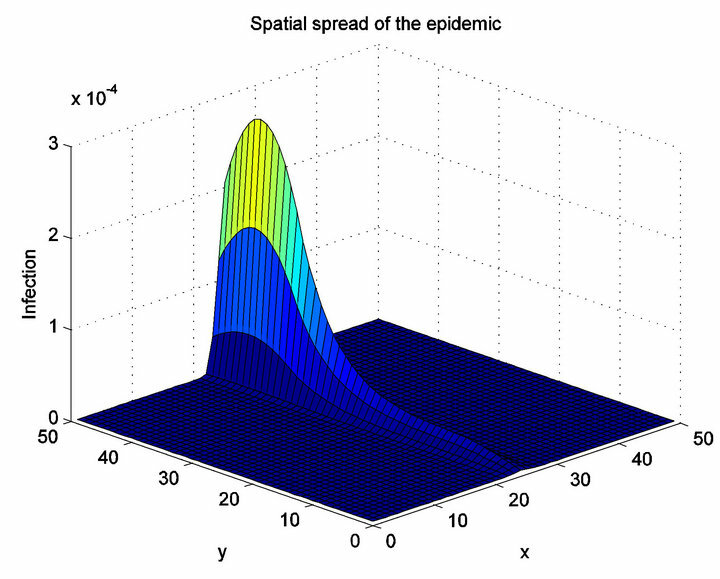 In the following figures we give the isovalues of the infection in a two dimensional environment. Figure 1 corresponds to the case in which the diffusion is isotropic. Figure 2 corresponds to the unisotropic case. We can see in the two cases the spread of the infection. Now we give some numerical results in order to show the effect of the medical care effort on the intensity of the epidemic in two different areas: site 1 and site 2, representing two cities with two different incidence rates. In Figure 3 we suppose that no effort for medical care is made. In Figure 4 we consider that the rates of medical care effort are in the site 1 and in the site 2. Then we note a decrease of the intensity of the infection in all the two sites. In Figure 5 we consider a medical care effort rate in site 1 and in the site 2. Then we note a decrease of the intensity of the infection in all the two sites. These results mean that all medical care effort in one of the regions contributes to the decrease of the epidemic in the other one. In Figure 6 we use simultaneously the same medical care effort rate in the two sites: , then we can see that the intensity of the infection decreases more. These results show that we can control the spread of the epidemic if we augment the medical care effort. A best result can be obtained, in the two sites, if efficient actions are done simultaneously in the two sites. Figure 1. 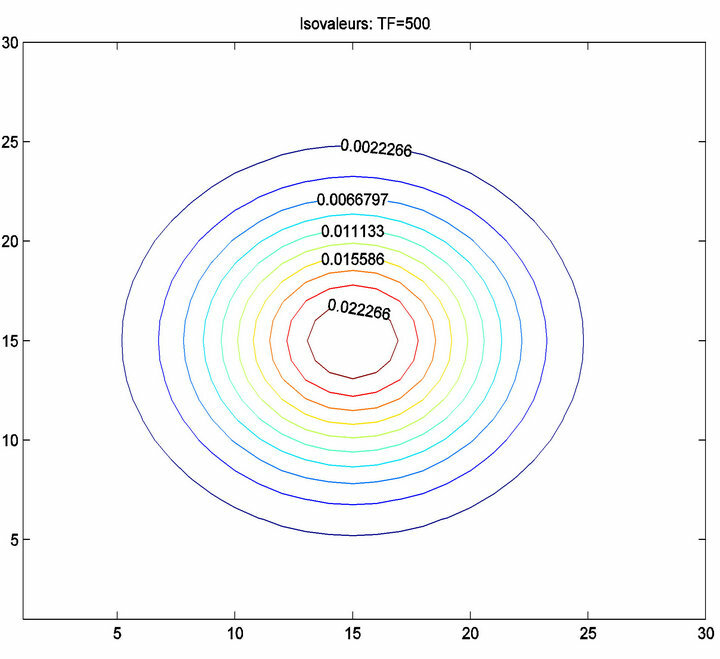 Isotropic case: isovalues of the spread in the domain at (a) t = 100; (b) t = 500. Figure 2. Unisotropic case: isovalues of the spread along the road at (a) t = 10; (b) t = 1000. Figure 3. 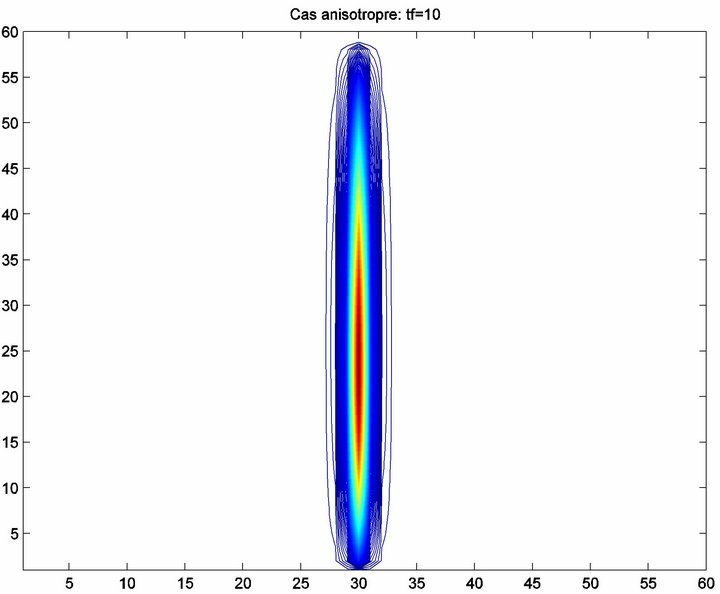 Unisotropic diffusion without medical care effort (β1 = β2 = 0) in the two areas at t = 300 and t = 350. Figure 4. Unisotropic diffusion with t = 300, (a) β1 = 0.15, β2 = 0; (b) β1 = 0, β2 = 0.15. Figure 5. Unisotropic diffusion, t = 300. (a) β1 = 0, β2 = 0.30; (b) β1 = 0.15, β2 = 0.15. Figure 6. 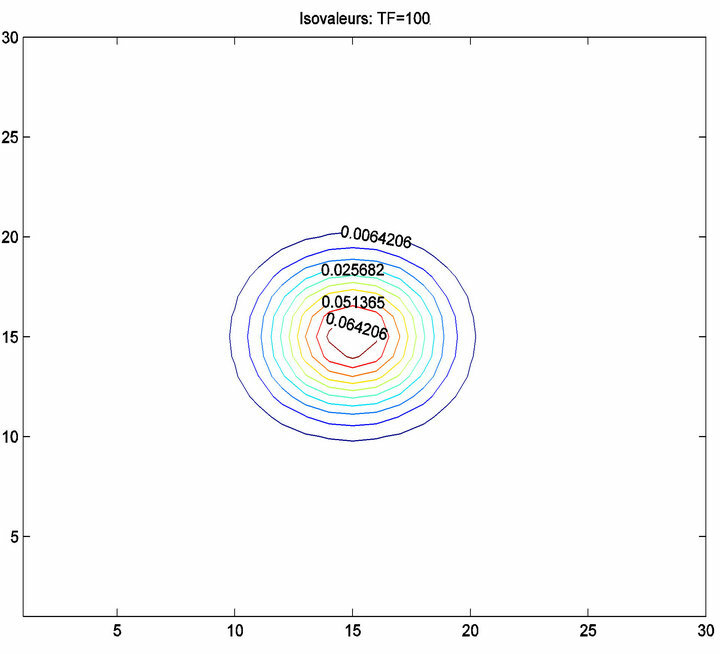 Unisotropic diffusion, t = 300. 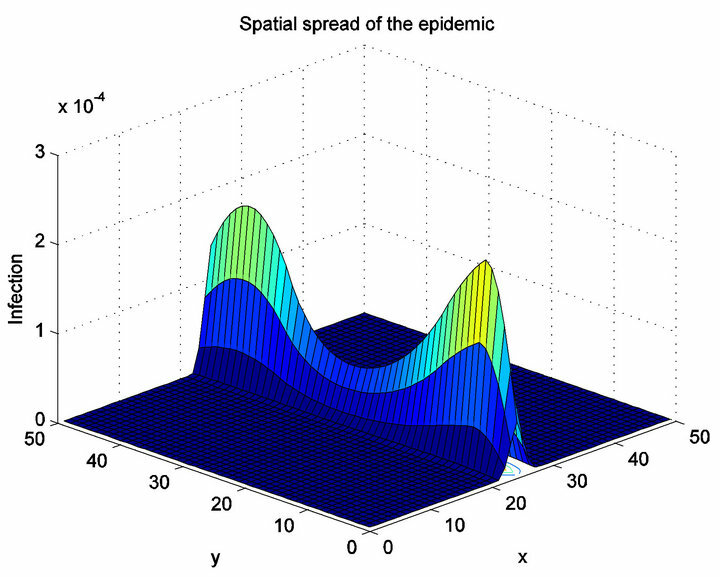 (a) β1 = 0.2, β2 = 0.2; (b) α1 = α2 = 0.013, β1 = 0.15, β2 = 0.15.
the incidence rate in the two sites and well control the spread of the infection (Figure 6(b) where ). In this way, it will be important that the leaders in the countries of the same area define together their policies in the fight against HIV spread. In conclusion, we can say that, in addition to the medical treatment, if in the two sites, we reduce the incidence rate by more sensitization, then we can expect that the epidemic is controllable. That must be an operational aim for the deciders to fight against the spread of VIH/AIDS. 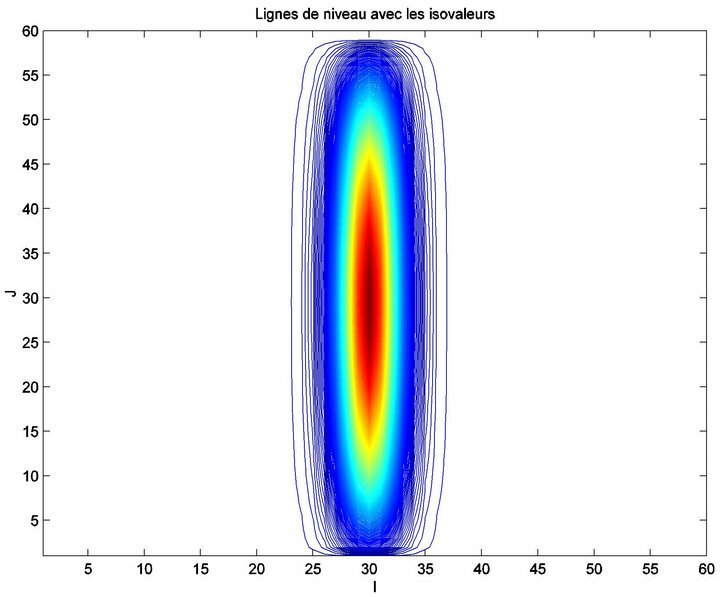 E. Maisse, “Analyse et Simulation Numérique de Phé- nomènes de Diffusion-Dissolution/Précipitation en Milieu Poreux, Appliquuées au Stockage de Déchets,” Thèse de doctorat, Université Claude Bernard-Lyon1, Lyon, 1998. L. Melkemi, A. Z. Mokrane and A. Youkana, “On the Uniform Boundedness of the Solutions of Systems of Reaction-Diffusion Equations,” Electronic Journal of Qualitative Theory of Differential Equations, Vol. 2005, No. 24, 2005, pp. 1-10. H. Brezis, “Analyse fonctionnelle,” Théorie et applications, Dunod, 2002. R. Dautray and J. L. Lions, “Analyse Mathématique et Calcul Numérique Pour les Sciences et les Techniques,” Vol. 3, Masson, Paris, 1985.